Initially a British folk-rock combo called Tyrannosaurus Rex, T. Rex was the primary force in glam rock, thanks to the creative direction of guitarist/vocalist Marc Bolan (born Marc Feld). Bolan created a deliberately trashy form of rock & roll that was proud of its own disposability. T. Rex’s music borrowed the underlying sexuality of early rock & roll, adding dirty, simple grooves and fat distorted guitars, as well as an overarching folky/hippie spirituality that always came through the clearest on ballads. While most of his peers concentrated on making cohesive albums, Bolan kept the idea of a three-minute pop single alive in the early ’70s. In Britain, he became a superstar, sparking a period of „T. 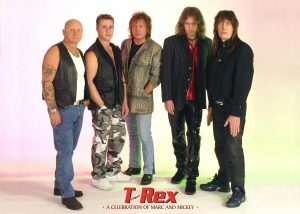 Rextacy“ among the pop audience with a series of Top Ten hits, including four number one singles. Over in America, the group only had one major hit — the Top Ten „Bang a Gong (Get It On)“ — before disappearing from the charts in 1973. T. Rex’s popularity in the U.K. didn’t begin to waver until 1975, yet they retained a devoted following until Marc Bolan’s death in 1977. Over the next two decades, Bolan emerged as a cult figure and the music of T. Rex has proven quite influential on hard rock, punk, new wave, and alternative rock. Ursprünglich war Tyrannosaurus Rex eine Britische Folk-Rock-Combo, entwickelte sich aber unter dem verkürzten Namen T. Rex und unter der Leitung von Gitarrist und Sänger Marc Bolan zu einer bestimmenden Formation des Glam Rock. In ihrem Heimatland wurden die Musiker durch eine Serie von Top Ten – Hits und 4 Nummer-1-Hits zu Superstars, insbesondere Bolan. In den USA hatte die Gruppe legidlich einen wirklich großen Erfolg zu verbuchen, „Bang a Gong (Get It On)“. Nicht zuletzt Marc Bolan’s früher, durch einen Autounfall verursachter Tod, machte den Musiker zu einer „Kultfigur“ – die Musik von T. Rex hat sich als Einfluss auf Hard Rock, Punk, New Wave und Alternative Rock erwiesen.